If you were to subscribe to the collective cultural consciousness, then you might fall victim to the school of thought that says a perfect match is hard to come by – a needlessly complicated affair. Not so. No matter which way you swipe it, life’s best pairings are often the simplest: think peanut butter on anything; Goldie Hawn and Kurt Russell; a quiet moment and a cup of coffee. Nothing understands this better than the Nespresso Essenza Mini, Nespresso’s smallest machine to date and a seriously stylish conduit for achieving café quality coffee at home with the kind of ease that bestows a sense of the extraordinary onto what is an otherwise every day ritual. Revolutionising the quotidian is also second nature to PS-Soda. Helmed by Michael Chiem (ex-Lobo Plantation) and Thor Bergquist (ex-Bulletin Place), their bar PS-40 is Sydney’s award-winning first soda factory crafting cocktails from a range of all-natural, locally made sodas perfected in-house using local and native produce. PS-Sodas are served not only in their singular bar – styled to monochromatic perfection by creative director Livia Lima – but for some of Sydney’s best restaurants, like Firedoor and Bennelong. 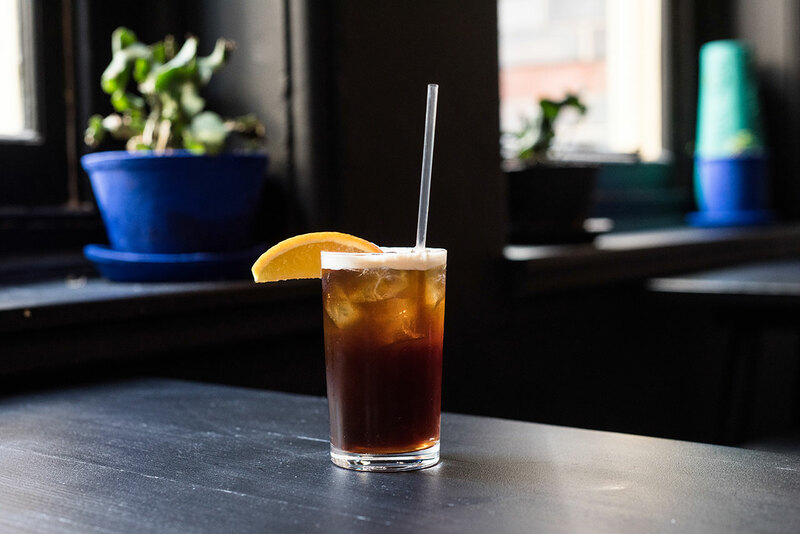 Inspired by the Black Russian – another deceptively simple yet winning pairing at work – Berquist has updated the cocktail classic by using wattleseed cola enlivened with the addition of a full-bodied ristretto shot of Nespresso Kazaar. Made in-house at PS-40 using wattle seed and cola nut, the soda’s notes of cassia bark, nutmeg, star anise, coriander seed, lavender, citrus zests and vanilla bean are the perfect accompaniment to the Kazaar Grand Cru’s bitter pepper flavour and smooth, creamy mouthfeel. The finished cocktail is impossibly simple and astonishingly fresh, enjoying an unexpected complexity despite a relatively simple list of ingredients: it’s the perfect combination of bitter and sweet, singing with bright citrus notes from an orange garnish and finished with a refreshing fizz. Build the drink in a highball glass filled with ice and top with 90ml of PS Wattle Cola. Garnish with orange wedge.